Features new and updated stories, new applications, new exercises, and a new chapter entitled "The Meaning Difference"
World-renowned psychiatrist Viktor Frankl’s Man’s Search for Meaning was named by the Library of Congress as one of the ten most influential books of the 20th century. Dr. Frankl’s personal story of finding a reason to live in the most horrendous of circumstances—Nazi concentration camps—has inspired millions. In his international bestseller, Prisoners of Our Thoughts, Dr. Alex Pattakos—who was urged by Frankl to write this book—shows how Frankl’s philosophy and approach can help readers find meaning in every moment of their lives. This revised and updated second edition features new stories and examples of people who have applied the principles in the book or who exemplify them; new practical exercises and applications; and a new chapter, “The Meaning Difference.”® This new chapter summarizes research demonstrating the critical role of meaning in improving the quality of people’s lives, increasing happiness, and promoting health and wellness. Drawing on the entire body of Frankl’s work, which includes over thirty books, Pattakos elaborates seven “Core Principles” and demonstrates how they can be applied to everyday life and work in the 21st century. These meaning-focused principles include the ultimate freedom to choose our attitude no matter the situation, the idea most closely associated with Frankl—but his ageless wisdom goes well beyond this. Pattakos applies each of the seven principles to various situations, enabling readers to relate personally to the principle and learn when and how to use it. 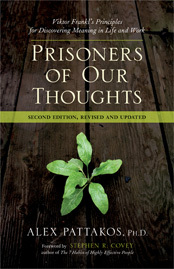 By making Frankl’s seminal thought accessible and relevant to a wide audience, Prisoners of Our Thoughts opens up new opportunities for finding personal meaning through living an authentic life.